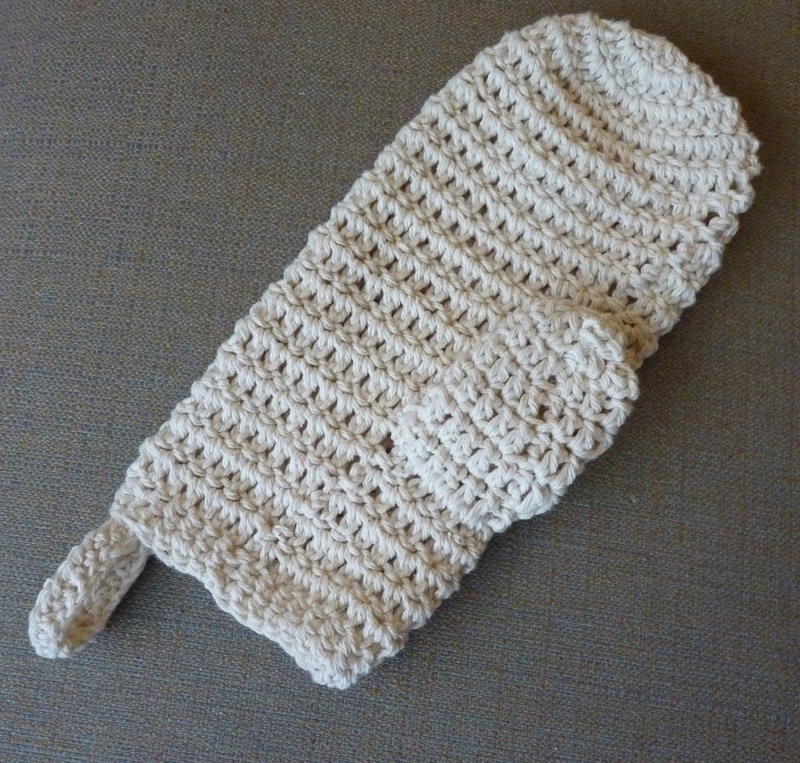 This is a quick and easy crochet project that would be a nice gift along with some shower gel or a bar of soap. Or do like I did and make it as a gift for yourself! At first, I wasn’t too sure about using crocheted items in the shower, but I’m really enjoying the crochet soap saver I made a while back, so I thought I’d give this a try to use with shower gel instead of a nylon “pouf.” I added a hanging loop to the corner of the mitt. Without a loop, what are you going to do with that wet mitt?! The pattern is included in the set of Crocheted Bath Accessories on Lion Brand’s website (pattern # ckc-bathAccessories). The pattern is free, but you may need to create an account and log in to see the pattern. I used Lily Sugar’n Cream yarn in Ecru. It’s a cotton yarn and is easy to work with. To make the hanging loop: sc 20; in 2nd chain from hook, hdc in each chain across. Sew to corner of mitt. My mitt came out larger than it needed to be. My gauge was off, because it turned out to be 10 inches long instead of 8.5 inches. The next time I make one of these, I’ll hold up my hand as I go along. 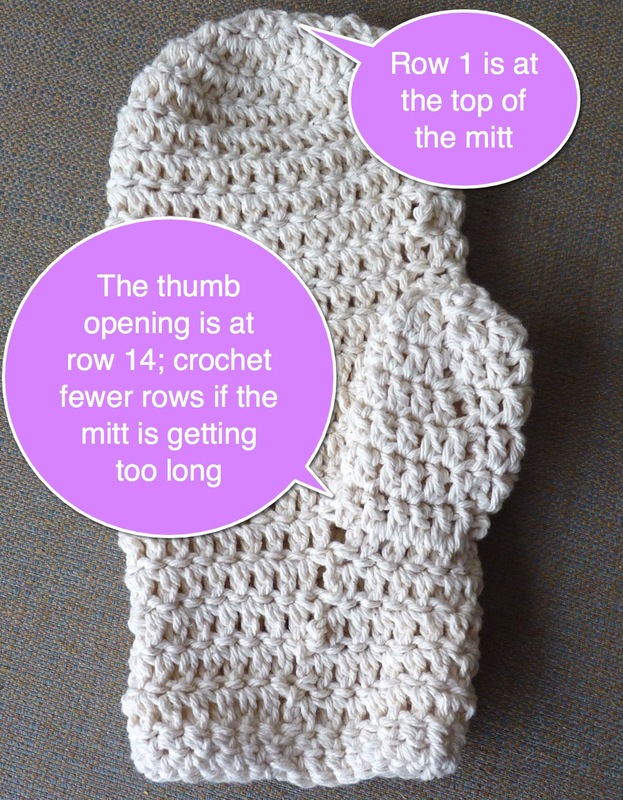 The thumb hole is at row 14, so if it’s long enough to fit the top part of your hand before you get to row 14, just skip crocheting some of the rows in the row 4-13 series and jump ahead to row 14 to make the thumb hole. This is great! I made a soap saver about a year ago, like the one you had made in you earlier post, but it didn’t work out. I used a synthetic yarn, which didn’t shrink at all. I ended up with a yarn pouch with a teeny bit of soap inside. I felt goofy trying to use it. This turned out really well and it’s so cute! What a wonderful idea-and I love that you made one for yourself. Merry Christmas!